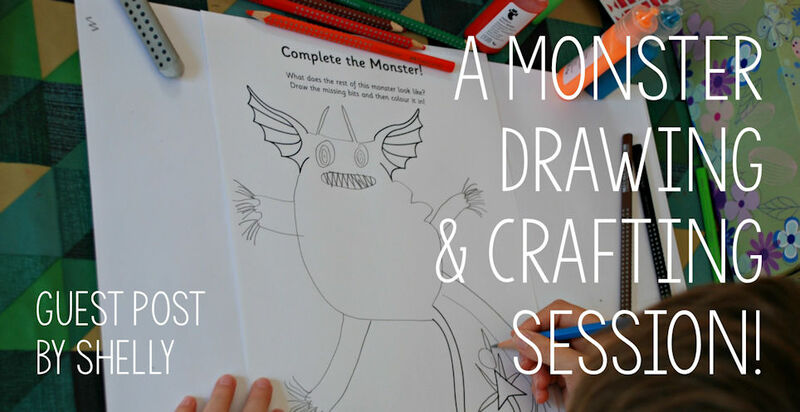 Guest Post - A Monster Drawing and Crafting Session! My seven-year old has been going through a bit of a drawing phase lately. So much so that we actually moved a little table to just next to my desk so that he can draw and chat while I am working on my computer. He loves it. But the one thing that he often struggles with is a starting point. What to draw? And he can spend ages just trying to decide. So I thought a few drawing prompts might be a good idea. I download a number of different Whose Wheels? pages and Whose Feet? and he loved the idea. He sat for ages at his table and created both realistic and some rather “fantastical” vehicles. So when I asked the kids want they wanted to do for an arty / crafty session my son immediately asked if we could use the "complete the picture" pages. We had a quick look and they both loved the idea of the monster ones – we don’t really do scary monsters but these pages were perfect as they allowed the kids to make the monsters as scary or as cute as they wanted. I printed ours out in black and white but there is also a colour version. My son seemed to stick to drawing his monsters. The finished monster - spectacular! He also had a go at creating an interesting monster covered in google eyes. Adding googly eyes to this monster! He says the idea was that it was an “octopus – type – monster that can see in all directions. The finished "octopus" monster - looking in all directions! And he could not resist having another go at one of the transport pages again (honestly these tractor / truck wheel pages have been printed out over and over again). My daughter loves colour and she definitely seemed to go more for the crafting approach to her monster pages – lots of bright colours. She did say that she was finding using crafting feathers a bit hard to work with as they never really fitted into the shape she wanted but she persevered and eventually ended up switching to wool. But I do think her idea of a Woolly Mummy was a good idea. Complete the monster drawing and collage finished! I must admit looking back at the different monsters created, my son’s are definitely more the type I would not like to meet whereas my daughter’s kind of make me want to give them a cuddle!